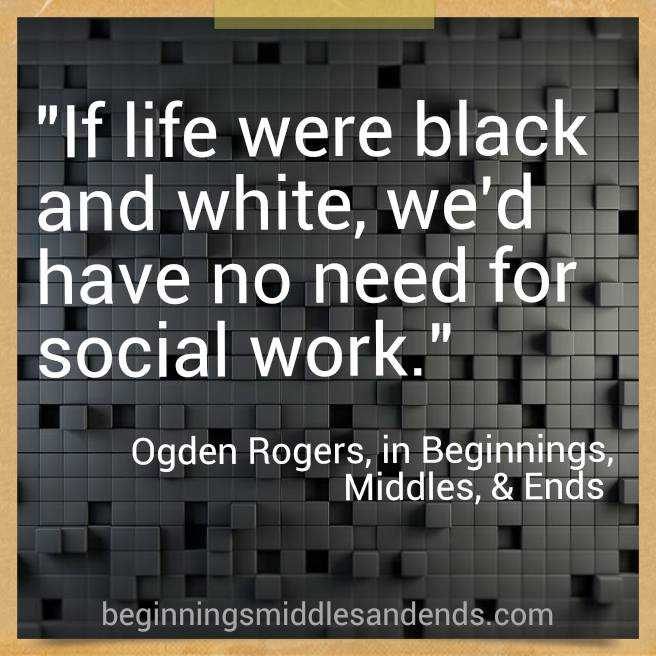 Listen to author Ogden Rogers read a short piece from Beginnings, Middles, & Ends: Sideways Stories on the Art & Soul of Social Work. This piece, from pages 57-58 in the book, is titled "Why not Why." Beginnings, Middles, & Ends: Sideways Stories on the Art & Soul of Social Work was reviewed in the Fall 2013 edition of the Journal of Social Work Values & Ethics, released this week. The mood that the author sets is the best aspect of this book. It reminds me of the mood set by the writers of the TV show MASH. There is a mixture of drama and comedy that is perfectly blended to capture the attention of a casual reader. I found the entire book a joy to read. Personally, I found it therapeutic. He also called the book "a profound piece of creative literature that will reinstill idealism within senior social workers who are on the threshold of being cynical about their work." Read the full review at: Journal of Social Work Values & Ethics, Fall 2013 edition. Author Ogden Rogers was interviewed by Al Ross of Spectrum West on Wisconsin Public Radio on November 7, 2013. They talked about the social work profession, as well as about Rogers' new book, Beginnings, Middles, & Ends: Sideways Stories on the Art & Soul of Social Work. Ross read a few of the shorter stories out loud as part of the broadcast. The interview provides insight into the thought that went into the writing of the book. The interview is archived online. You can listen to it here. Then go to Amazon.com or White Hat Communications to order the book and read the rest of the stories! Since Beginnings, Middles, & Ends: Sideways Stories on the Art & Soul of Social Work was released almost a month ago, the book has continued to receive favorable reviews. "LOVE THIS BOOK! I shared it with my interns who are young social workers. I would HIGHLY recommend it! Makes a great gift for social workers." 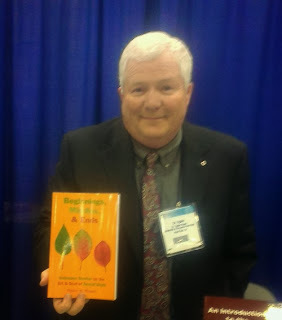 The book was well-received at the recent Council on Social Work Education (CSWE) Annual Program Meeting, where Rogers was on hand to autograph copies. The book is available at Amazon.com in print and Kindle editions, as well as at White Hat Communications' online store. Order now for holiday and graduation gift-giving, or put it on your own wishlist! Today Is the Day--Beginnings, Middles, & Ends Official Release Date! 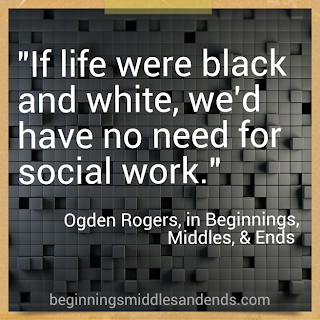 We are very excited to announce that today is the official release date of Beginnings, Middles, & Ends: Sideways Stories on the Art & Soul of Social Work, by Ogden W. Rogers! We are very appreciative and excited that the book has received advance praise from readers. Also, reviews and interviews with the author have been published by Social Work Career Development blog and Social Justice Solutions. Thank you! Author Ogden Rogers calls the book a mixture between "The Hitch Hiker's Guide to the Social Work Universe" and "Everything I Needed To Learn I Learned in Social Work School." To celebrate the book's release, the publisher is offering a 15% discount now through October 22, 2013. Go to the White Hat Communications store and use coupon code LAUNCH15 to receive 15% off this book (and other social work books, too). Beginnings, Middles, & Ends is also available at Amazon.com in print and Kindle formats. Additionally, it is available in ebook format at the Google Play Store. Beginnings, Middles, & Ends: Sideways Stories on the Art & Soul of Social Work has received another great review! Published on October 7, the review and interview appears on the Social Justice Solutions site. "Seasoned or more experienced social workers will be nodding their heads and smiling while remembering their own beginnings in the field. Social work students will see the book as a wonderful learning opportunity and get an idea of what lies ahead and those relatively new to the profession will ‘see’ or ‘be’ a mixture of the two"
"I like to say the book is sort of like 'The Hitch Hiker’s Guide to the Social Work Universe' meets 'Everything I needed to learn I learned in Social Work School'… The book is a collection of 99 stories, some of them quite short (I call them 'potato chips') that reflect beginnings, middles, and ends- mostly about social work relationships.... The idea is that there might be something in any story to think, feel, or resonate with the reader." "Simply put, I loved it...in the early to mid-90s...that’s when I 'discovered' the brilliance of his writing. I first published one of his pieces in 1995 [in The New Social Worker]. This book...is very real—he’s willing to write about mistakes he made along the way and how he learned from them, so others can learn from them, too. But he also uses an artistic story-telling approach to show readers how social workers can think outside the box to come up with creative ways to find solutions to problems." Read the full review and interview here. Beginnings, Middles, & Ends -- New Developments and Buzz! Book review and interview with author Ogden Rogers, Social Work Career Development blog, September 25, 2013, blogger DorleeM called the book "a most enjoyable and inspiring reading about life as a social worker." Additional reviews and interviews are forthcoming, so please stay tuned to this site! Beginnings, Middles, & Ends: Sideways Stories on the Art & Soul of Social Work was featured on the Information for Practice website in August. IP is a great site that brings together social work "news, new scholarship, and more from around the world." Its mission is "to help social service professionals throughout the world conveniently maintain an awareness of news regarding the profession and emerging scholarship." Thank you to Dr. Gary Holden at NYU Silver School of Social Work! To order Beginnings, Middles, & Ends, please visit the publisher's online store. Kindle edition is available at Amazon.com. Have you been waiting for Beginnings, Middles, & Ends: Sideways Stories on the Art & Soul of Social Work to come out in a Kindle edition? Well, it is here! You can also view a sample of the first several stories in the book by going to the Kindle page and clicking on the book cover. Available now directly from the publisher. 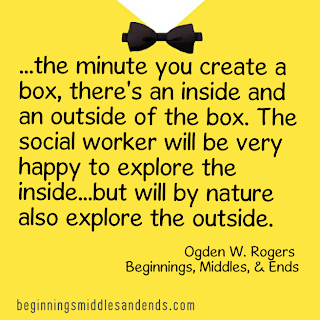 This excerpt is from page 16 of Beginnings, Middles, & Ends: Sideways Stories on the Art & Soul of Social Work, by Ogden W. Rogers. Copyright 2013. All rights reserved. I pulled aside the curtain. The patient was lying on the gurney, bandaged in several places and on an IV. For more information and to order the book, please visit the publisher's website. The idea for this book came from what I call a “sideways story.” A sideways story is some little (or big!) moment in life when you thought you were doing one thing, but you ended up learning another. A sideways story can also be a poem, or prose, that, because of the way it is written, may not be all that direct in its meaning. What’s nice about both clouds, and art, is that you can look at them and just resonate. I think that can be good for both the heart and the mind. Some months ago, I received a letter from a professor with whom I had studied in undergraduate school. He had been the chaplain at the college I attended, and I remembered him as a gentle man of integrity. He had seen an article about some work I was doing in the college alumni magazine, and sent me a letter commending my efforts. I was quite flattered. In the letter, he wrote that he was reminded of a story I had written as a young man, apparently for one of his classes. The story, he said, was about an old man whom I had come to know while working in a hospital, and who had died. A line in the story he remembered went: “Mr. Etters died yesterday. And with his death, a story ended. Not just a person had died, but a history, memories, and an unfolding story of life that could only be told by this one man also ended.” He told me that he had never forgotten that story, and that he reflected upon it as he had gone into semi-retirement and pastoral counseling of persons with terminal illnesses. I was deeply moved that anything I had ever written had “stuck” with somebody. While the story sounded familiar, I did not remember it, and I went scouring about in my files, looking at all my undergraduate work, to see if I had kept it. (I am a world class “pack-rat” and have thrown away almost nothing in my life!) Looking off and on for weeks, I could not find the story anywhere in my files. In the search, however, I had come across all sorts of odds-n-ends of things I had written. I have always, since a small boy, been prone to writing some of my thoughts and observations down in various forms...almost all of it mostly for myself, or shared with small audiences of clients, students, or colleagues. Not really published. It dawned upon me that like Mr. Etters (and everybody else in the world), I too had accumulated a basket of stories. In re-reading the scraps of essays, poems, and stories I had written, I considered that in some ways they were less about “me” (whatever that is! ), and more about a life following a path of a social worker. I became arrogant enough to think you might enjoy reading some of them. I’m the hero in some of the stories; sometimes I’m the fool. I have probably learned more from the ones where I am the fool. We talk nowadays about “research informed practice and practice informed research.” Throughout my career, I’ve considered many theories. Theory about human behavior, theory about social change, theory about the nature of reality have all swirled about in my life and practice. I have used, and been used by, theories. At times throughout this book, you might find a footnote or two that might point you to investigate something further. But mostly, this book is about how a life in social work is made up of stories. Beginnings, Middles, & Ends is available now from the publisher's website. I literally moved back and forth between tears of soulful recognition and laugh-out-loud moments of wonderful remembrances. There is something truthful and powerful about the artist who is willing to put a masterpiece together and leave the telltale signs of failed attempts. Too many who reflect on their past do so to minimize imperfection, setting standards unreachable by others. Ogden Rogers has charted a course of professionalism that encourages creativity, allowing for errors, and guided by honest reflection and dedication to those whom he would serve. Click on the "Praise" tab to read more comments about Ogden Rogers' collection of stories, poems, and thoughts about life in the profession of social work. 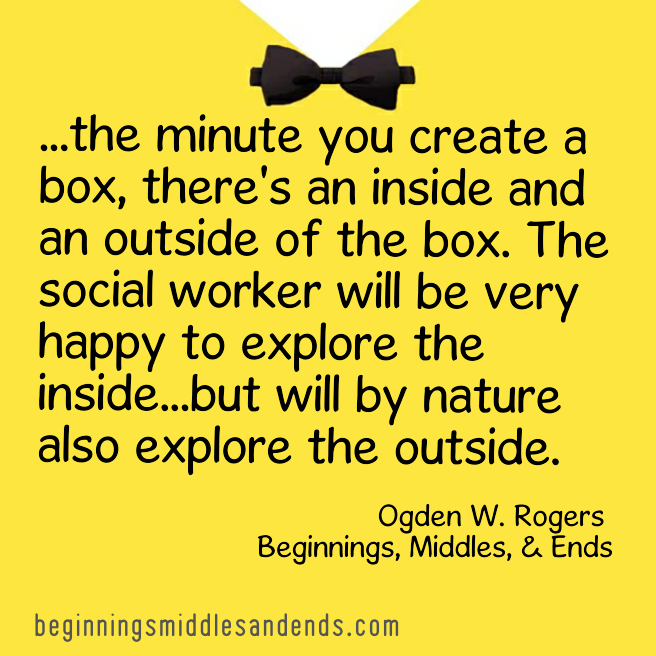 Here is a glimpse of the front cover of Ogden Rogers' Beginnings, Middles, & Ends: Sideways Stories on the Art & Soul of Social Work. The image of three leaves shows three stages in the life of the leaf...the beginning, middle, & end. Social work practice (and life) is made up of these same three stages...beginnings, middles, & ends. The book is available for pre-ordering from the publisher (White Hat Communications) now! 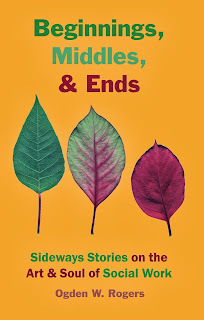 Coming soon: Beginnings, Middles, & Ends--Stories of social work worth reading! Written in the spirit of DAYS IN THE LIVES OF SOCIAL WORKERS, this book is built from the life of the days of a social worker. Ogden Rogers has written a collection of essays, poems, and other writings about life in social work, and about life in general. 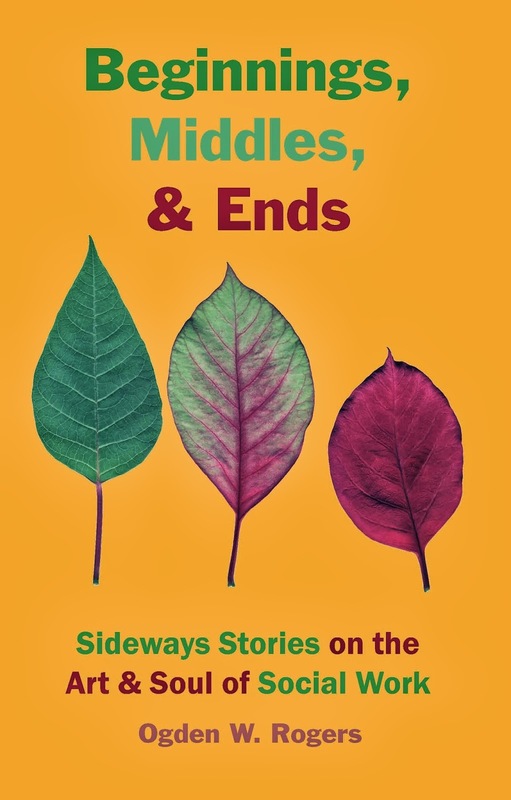 It is called BEGINNINGS, MIDDLES, & ENDS: SIDEWAYS STORIES ON THE ART & SOUL OF SOCIAL WORK. The book is filled with humor and with candid real-life stories of what it's like in the profession of social work. It’s my hope that some of the things here might make some moment in your thinking or feeling grow as a social worker. If they provoke a smile, or a tear, or a critical question, it’s worth it. Some of the pieces are experiences from my interior and may not seem immediately relevant to your life as a social worker. If you get bored, skip a piece, and read something else. ... I wrote this book for colleagues, social work students and their teachers, and to be very honest, for myself. In the seasons of studying social work, students have to read a lot of textbooks and professional literature. I know, I’ve had to read a lot of those things, and they are good to read...but sometimes, it’s good to take a break and just read something that’s just a little off center and not in APA style! Something to read, well, just for the heck of reading. This book of a hundred stories reads easily, and the author tells tales that operate at many levels. The stories exemplify role modeling and transformational learning theories, and readers are encouraged to reflect and consider their own thoughts and reactions to each piece. It's written in an easy, non-linear style that is filled with wit, wisdom, and drama. In many ways, it is a book that looks at social work from the inside out, and seeks to provide the reader with opportunities for validation, surprise, critique, and reading enjoyment. Ogden W. Rogers, Ph.D., LCSW, ACSW, is Professor and Chair of the Department of Social Work at The University of Wisconsin-River Falls. He has been a clinician, consultant, educator, and storyteller. Read more about him on the About the Author page. So, if you are curious to learn more, please use the "Follow by e-mail" form on the right side of this page, and we'll keep you updated on new developments on this exciting new book. And we'll let you know when and how it's available!